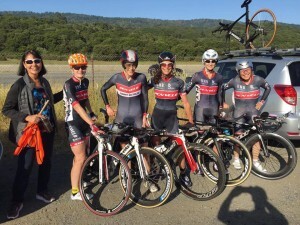 Come join us for a women’s recruitment ride to learn more about Pen Velo and racing in general. No prior racing experience needed, but you should be comfortable riding 16+ mph on flats and rolling terrain. We will ride about 30-35 miles in the Woodside area, rolling terrain (no sustained climbs). 8:30am: Meet some PV women – ask us anything! Let us know if you have any questions (Email), or join our event on Meetup! With the onset of Daylight Savings Time, the Tuesday/Thursday group rides will begin on Tuesday, March 10, 2015 and will continue through the third Thursday in September. Rides start at Canada Rd and Hwy 92. These rides are very fast paced (22-24mph) with a great deal of assertive/aggressive riding. Click HERE for more information on the evening rides. For those who desire a less intense (19-22mph) evening ride, there is a “B” group which departs from Canada & 92 at 5:50pm. Click HERE for more information on the “B” ride. In early March, please be sure to bring a bike light – the sun will set shortly before the ride returns to the start (7:15-7:25pm). Save the date! The next no-drop “Coffee Ride” will take place on Saturday, December 6, 2014. Check the ride page for details. This ride leaves from Canada Rd & 92 at 8:15am, but strives to go slower and longer than the weekly Saturday club ride (40-50mi, 15-17mph). The ride is open to both PV members and non-members. If you have not done this ride before, please RSVP to the ride leaders first. For more information or to RSVP, contact the ride leaders, Franklin Rice and Ken Jorgensen (coffeeride@penvelo.org). Save the date! 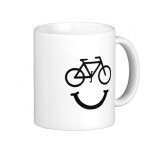 The next no-drop “Coffee Ride” will take place on Saturday, November 1, 2014. Check the ride page for details. This ride leaves from Canada Rd & 92 at 8:15am, but strives to go slower and longer than the weekly Saturday club ride (40-50mi, 15-17mph). The ride is open to both PV members and non-members. If you have not done this ride before, please RSVP to the ride leaders first. For more information or to RSVP, contact the ride leaders, Franklin Rice and Ken Jorgensen (coffeeride@penvelo.org). Our monthly no-drop “Coffee Ride” will take place this Saturday, October 4, 2014. This ride is targeted at newer riders looking for some more fitness or/and group riding experience before joining the regular club ride, non-club riders looking for an introductory ride, and more experienced riders who want to get some recovery miles in their training. The pace and duration should fit squarely as a base/recovery ride in a more experienced riders training calendar, or as a challenging but very achievable ride for a less experienced rider. Women riders should find the pace manageable and are encouraged to join in. If you know someone who is considering joining the club, but would like to ease into it, please send them our way. We will depart with the regular club ride from Canada/92 at 8:15am, then drop off at the end of Canada and STOP and regroup at Roberts Market, to then do our own ride from there. This gives riders the length of Canada to decide whether they want to do the regular club ride or get in some social base miles with the Coffee Ride. The ride leader will drop back through the club ride as we approach Woodside Rd, to announce the ‘no-drop’ regroup at Roberts. The ride will be somewhere in the range of 2.5 to 3 hours (40-50 miles, 15-17mph), inclusive of coffee stop. 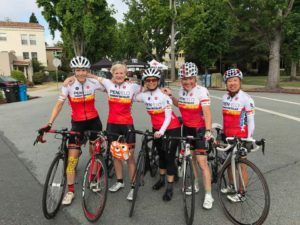 The route varies, but a typical ride would take us through Woodside and Portola Valley, then along Foothill Expwy to the Stevens Creek Reservoir. At the reservoir we will double back, making a coffee stop in Los Altos on our return trip back to Canada/92. The ride is open to both PV members and non-members. If you have not done this ride before, please RSVP to the ride leaders first. For more information or to RSVP, contact the ride leaders, Franklin Rice and Ken Jorgensen (coffeeride@penvelo.org). Our next monthly no-drop “Coffee Ride” will take place on Saturday, September 6, 2014. The monthly no-drop “Coffee Ride” will take place this Saturday, August 2, 2014. Due to the July 4th holiday the no-drop “Coffee Ride”, which usually takes place the first Saturday of each month, will take place on the second Saturday (July 12) for July only. 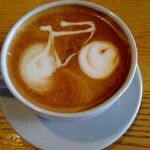 In August, the Coffee Ride will return to its regular spot on the calendar. This ride is targeted at newer riders looking for some more fitness or/and group riding experience before joining the regular club ride, non-club riders looking for an introductory ride, and more experienced riders who want to get some recovery miles in their training The pace and duration should fit squarely as a base/recovery ride in a more experienced riders training calendar, or as a challenging but very achievable ride for a less experienced rider- and of course, it’s ‘no-drop’, so the pace changes to accommodate. If you know someone who is considering joining the club, but would like to ease into it, please send them our way. We will depart with the regular club ride from Canada/92 at 8:15am and then drop off at the end of Canada and STOP and regroup at Roberts Market, to then do our own ride from there. This gives riders the length of Canada to decide whether they want to do the regular club ride or get in some social base miles with the Coffee Ride. The ride leader will drop back through the club ride as we approach Woodside Rd, to announce the ‘no-drop’ regroup at Roberts. The ride will be somewhere in the range of 2.5 to 3 hours, inclusive of coffee stop. Through Portola Valley to Los Altos. At Stevens Creek Dam we will double back, making a coffee stop in Los Altos on our return trip back to Canada/92. No advance registration or club membership is required to participate in this ride. If you have questions about the ride or your ability to participate in it, please contact the ride leaders, Franklin Rice and Ken Jorgensen (coffeeride@penvelo.org), who will be happy to discuss details with you in advance.